Sometimes it’s easy to forget how far north Ireland is. Palm trees grow in Sligo on the northwest Atlantic coast whereas glaciers---though in retreat ---overshadow Grytviken, South Georgia (Fig. 1). Grytviken is as far south as Sligo is north, so why the big difference? Frequently people will cite the Gulf Stream as the reason for Ireland’s mild climate. This is an idea dating back to Matthew Fontaine Maury who coined the idea that the Gulf Stream was responsible for Europe’s mild climate in 1855. But the Gulf Stream itself is not inherently unique. It is an ocean current, called a ‘Western Boundary Current’ due to its location in the western North Atlantic, analogues of which exist in every major ocean basin. In the North Pacific, the Kuroshio is a western boundary current just as vigorous as the Gulf Stream. But when we look at surface temperatures relative to relative to the average for that latitude (Fig. 2), the Atlantic does stand out as anomalously warm. The ocean process that drives the anomalous warmth in the Atlantic is the Atlantic Overturning Circulation. This is a system of currents that carries warm water northwards, through the Gulf Stream and its extended current, the North Atlantic Current. This water is warm and salty. As it loses heat, through a variety of processes, it forms deep, cold water that returns southwards. This exchange of warm and cold water leads to the largest movement of heat by any ocean. This heat is then released from the Atlantic and is carried by the prevailing winds over northwest Europe. This combination of ocean and wind is the reason for the exceptionally mild climate of northwest Europe. The combination of winds and ocean is important and leads to a subtlety in discussing this Atlantic Exceptionalism. It might be tempting to look across from the cliffs of Moher in winter to the frigid Labrador coast of Canada and ascribe the almost 10 degrees C difference in temperature to the Atlantic Overturning. However, much of this temperature difference is due to this coast being downwind of the frigid Canadian landmass whereas Ireland is downwind of the ocean. 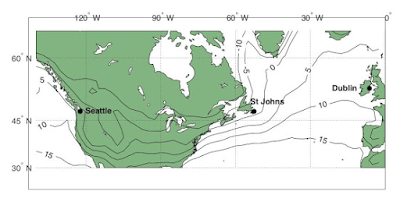 A better comparison to reveal the impact of the Atlantic overturning on climate is to compare Ireland to similar maritime climates of the Pacific northwest. Dublin is 4C warmer than Seattle in winter and this difference can be mainly ascribed to the influence of the Atlantic Overturning Circulation. While not as dramatic a comparison as with the coast of Labrador, a mean difference of 4C is approximately the difference in temperature between the climate of Ireland and the climate of Northern Portugal. The Atlantic Overturning has changed in the past, with large fluctuations in climate in the last glacial period associated with collapsing and recovering of the Overturning circulation, and it is predicted to decline in the future---the Intergovernmental Panel for Climate Change ranking as 'very likely' that the Overturning Circulation will weaken by 30% in the coming century. If the overturning declines, this will have a serious impact on Irish climate. Evidence for a declining overturning is already mounting. Temperatures globally continue to rise due to anthropogenic global warming but, in the North Atlantic, a cold spot appears where a small temperature fall is occurring. Here at ICARUS, work is ongoing to understand the ongoing changes in the Atlantic, including understanding the drivers and the impacts that has on Ireland, northwestern Europe and beyond. 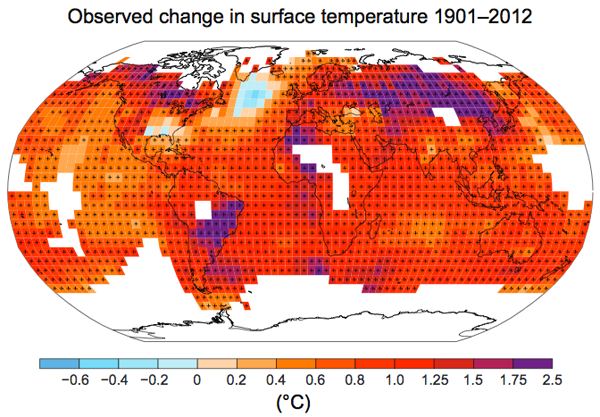 Figure 4: Global surface temperatures show a general increase due to anthropogenic climate change. A blue area in the North Atlantic shows where temperatures have not risen and could be indicative of a slowdown in the Atlantic Overturning Circulation. Is fusa dearmad a dhéanamh ar cé chomh fada thuaidh is atá Éire. Fásann crainn phailme i Sligeach ar an gcósta thiar ó thuaidh. Ar an leithead céanna, i nGrytviken, sa tSeoirsia Theas (Fig. 1), feictear oighearshruthanna, cé go bhfuil siad ag cúlú de bharr athrú aeráide. Cad í an chúis don difríocht seo? Go minic, deirtear gurb é an teas a thugann Sruth naMurascaille leis i dtreo na hEorpa cúis na h-aeráide chineálta in Éirinn. Matthew Fontaine Maury a mhol an smaoineamh sin i 1855. Ach ní hé Sruth na Murascaille amháin gur cúis le seo. Is sruth aigéin é Sruth na Murascaile ar a glaotar ‘Sruth Teorann Iartharach’ de bharr a shuíomh in iarthar an Atlantaigh Thuaidh. Agus tá a leithéid de na sruthanna seo i ngach aigéan. San Aigéan Ciúin, is sruth teorann iartharach é an Kuroshio atá chomh láidir le Sruth na Murascaille. Ach, nuair a fhéachaimid ar na teochtaí dromchla i gcomparáid le meán-teocht an leithid (Fig. 2), seasann teochtaí arda aimhrialta an Atlantaigh amach. Glaotar Iompu Imsruthu an Aigéin ar an gcóras aigéin a bhogann an teas seo i dtreo iarthuaisceart na hEorpa. Is córas sruthanna aigéin é Iompú Imshruthú na Mara a bhogann uisce te ó thuaidh, i Sruth na Murascaille mar shampla. Tá an t-uisce seo te agus goirt. Agus an t-uisce seo ag cailliúint teasa de bharr próiseas éagsúla, cruthaíonn sé uisce fuar, domhain a fhilleann ó theas. Cruthaíonn an malartú den uisce fuar agus uisce te seo an iompar teasa is mó san aigéan. Scaoiltear an teas seo ón Atlantach agus iompaítear é i dtreo na hEorpa ag na príomhghaotha. ‘Sé meascán an aigéan agus an ghaoth cúis don aeráid chineálta eisceachtúil atá in iarthuaisceart na hEorpa. Is tábhachtach é an meascán de ghaotha agus aigéan sa chomhrá faoi Eisceachtúlacht Atlantaigh. Ba éasca é féachaint ó Aillte an Mhóthair i rith an gheimhridh go dtí cósta fuaránta Labrador igCeanada agus an difríocht 10 gcéim Celsius a chur i leith iompú an Atlantaigh. Ach is í cúis an difríocht teochta seo ná go bhfuil Labrador le cóir na gaoithe ó mhórchríoch fuaránta Cheanada, agus tá Éire le cóir na gaoithe ón aigéan. Is fearr an comparáid chun tionchar iompú an Atlantaigh ar an aeráid a léiriú, ná an comparáid idir Éire agus aeráid mhara den chineál céanna in iarthuaisceart an Aigéin Chiúin. Tá Baile Átha Cliatha 4C níos teo ná Seattle sa gheimhreadh agus is de bhuíoch iompú an Atlantaigh an difríocht seo. Cé nach bhfuil an comparáid seo chomh géar leis an gcósta Labrador, is ionann é difríocht 4C idir aeráid na hÉireann agus aeráid Portaingéil thuaidh. Tá Iompú an Atlantaigh athruithe, le luaineacht mór san aeráid san oighearthréimhse deireanach ceangailte le titim agus athbheochan an sruthú iompaithe. Táthar ag tuar go dtiocfaidh meath ar an sruthú sa todhchaí – deir an Painéal Idir Rialtais don Athrú Aeráide go bhfuil an-seans go laghdóidh an Sruthú Iompaithe de 30% sa chéad atá amach romhainn. Má thagann an meath seo ar an sruthú, beidh tionchar ollmhór ar aeráid na hÉireann. Tá fianaise de seo ag méadú cheana féin. Tá teochtaí domhanda ag ardú ar bhonn leanúnach de bharr téamh domhanda antrapaigineach ach, san Atlantach Thuaidh, feictear spota fuar áit a bhfuil teocht íseal ag tarlú. Ag ICARUS, táimid i mbun oibre chun tuiscint a fháil ar athruithe leanúnacha an Atlantaigh, chomh maith le tuiscint a fháil ar an tionchar atá ag sin ar Éirinn, ar iarthuaisceart na hEorpa agus ar áiteanna níos faide ó bhaile. Fascinating! Can you speculate in more detail about the changes in weather we might expect here in Ireland? Thanks! In terms of mean climate, we could expect a drop in temperatures relative to global climate of about 5ºC with the total collapse of the Overturning Circulation. In terms of present day climate, that would make Ireland's climate closer to that of Iceland. In terms of weather, one of the likely effects would be an increase in storminess. The jet stream that is responsible for much of the weather directed towards Ireland is influenced by the temperature of the ocean below. A slowdown in the overturning would cause the northern part of the Atlantic to cool substantially. Indications are that this could increase storminess in Ireland. Indeed, the winter of 2013/14 was the stormiest on record in Ireland and this was a time when the overturning was weak.